1) What is a Farmall Cub? 2) Which model Cub is the right one for me? 3) How do I identify the year of my Cub? 4) Is there any way to determine the year of my Cub if the tractor serial number plate is missing? 5) How much horsepower does my Cub have? 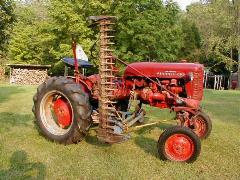 6) What do I need to be able to maintain a Farmall Cub? 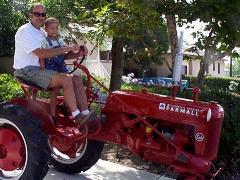 8) What can I do with a Farmall Cub? 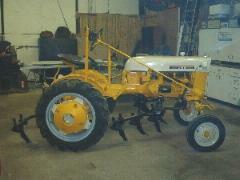 9) What additional items do I need to mount implements on my Cub? 10) What things should I look at when inspecting a Cub for possible purchase? 11) What does a Cub weigh? 12) Is it safe to operate a Cub on a hillside? 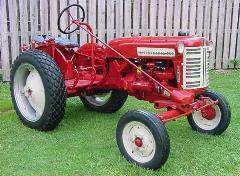 International Harvester manufactured the Farmall, or International Cub from 1947 through 1979. Cubs were manufactured during this period in two major variations. The Standard Cub, and a Lo-Boy version. The Lo-boy was introduced into the line in 1955, the Lo-Boy utilized a front end with shorter spindles, and rotated the rear final drive housings 90 degrees to lower the machine about 8 inches. All models were mechanically similar, with a 4 cylinder in-line water cooled L -head engine designed and built by International Harvester for the Cub. All Cubs were “Row Crop” models, wide front end, with a wide adjustable front end available as an option. The rear wheel tread was adjustable by changing the way the rims bolted to the wheel disks, and how the wheel disks bolted to the rear axle. All models had a 3 speed transmission, separate left and right wheel brakes and foot operated clutch. With 12″ front wheels, 24″ rear wheels and Ag style tires standard, other wheel sizes and types were available as an option. On 6 volt positive ground Cubs care must be taken to make sure the battery in installed correctly, POSITIVE CABLE TO GROUND. The other precaution is when jumping the tractor from an automobile or truck, make sure that there is no metal to metal contact between the tractor and the vehicle you are jumping from, as most modern cars and trucks are 12 volt negative ground. In any case, using a 12 volt battery to jump start a 6 volt system is generally considered an unsafe practice. 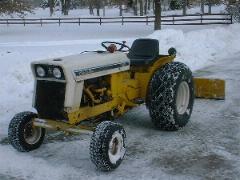 By the usual designation of the time, the Cub was considered a “single-plow” tractor, since plowing was considered the primary use for such machines. The Cub, as was typical of this generation of tractors, relied on the power train as the main chassis, with no frame whatsoever. All attachments and implements are attached to the hitch or to front and rear mounting points placed in the various power train castings. While originally marketed as a replacement for a single horse during the accelerated agricultural mechanization that occurred after W.W.II, the Cub soon found favor with road departments, landscapers and estate managers due to it’s simplicity, flexibility, dependability, and ease of use by people not familiar with traditional farm equipment. 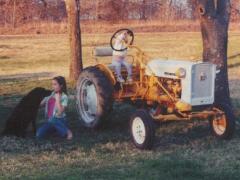 IH also actively marketed the Cub to people that were small acreage, and part time farmers. And like the Allis Chalmers G, a lot of Cubs ended up on vegetable truck farms. Due to the significant decline in the number of small family farms in the US in the latter half of the 20th century, relatively few Cubs were still used in farming by the end of the line’s manufacture. Cubs can be found with McCormick, McCormick-Deering, Farmall, and International Harvester decals, but all of them were manufactured by IH. 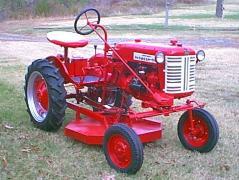 Most Cubs manufactured for the agricultural market were painted Harvester Red, a darkish red with silver rear wheel rims at the factory, but IH delivered them in many other colors at the customer’s request. All Cubs combined the fuel tank and the hood into a single assembly which was bolted into place, somewhat limiting access to the top of the engine. Another limitation is the single casting, which combines the steering box, front engine mount and lower radiator tank. Damage to this casting can occur with operator carelessness and can be somewhat expensive to repair. New castings are not available from CaseIH, the inheritor of the International Harvester tractor business. During this period you could buy the Cub with various options. 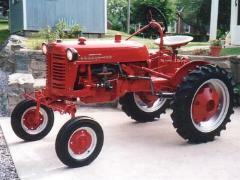 The Farmall Cub series of tractors incorporated the “Culti-Vision” design, previously introduced with the larger Farmall A and B tractors. In the Cub, this was accomplished by offsetting the engine 8 inches to the left and the seat about 6 inches to the right. This improved the operator’s field of view when using front or mid mounted equipment for precision farming. 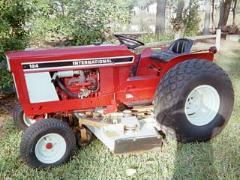 In 1968 International introduced another series of tractors that was based upon Cub components. These tractors were not offset, and used a perimeter frame for support. They are generally refered to as the Cub Lo-Boy series and replaced the offset style Lo-Boy. 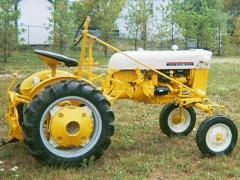 These tractors were manufactured through 1980, in 3 variations, the Cub 154 Lo-Boy, Cub 185 Lo-Boy and 184 Lo-Boy. They were marketed towards the landscaping and grounds keeper industries, and most were sold with 60 or 72 inch mower decks. 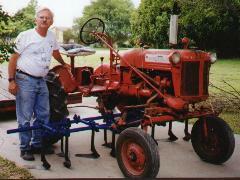 They utilized the same engine and basic transmission design, but implements designed for the earlier style Cub’s will not work on these tractors. They also incorporated an electric clutch on the PTO. This was done to allow the machine to have live power to the mower decks. Making your choice between a Farmall Cub and an International Cub Lo-Boy depends on what you want to use it for. 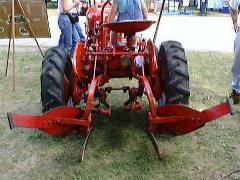 The Farmall Cub has more clearance under the axles than the Cub LoBoy. It was designed for row-crop work. If your plans include much garden work or other tasks where ground clearance is required, the farmall Cub is for you. If you will be doing mowing, working around trees and other grounds maintenance, the lower profile of the Cub Lo-Boy may be a better choice. 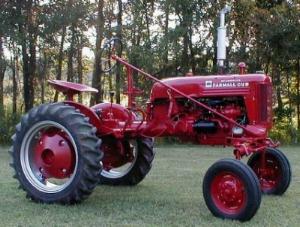 Be sure to look below at the answer to “What can I do with a Farmall Cub?” for more help in selecting the right model. 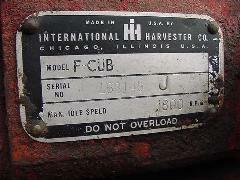 Cub serial numbers are on a plate attached to the steering gear housing on the right side of the tractor. 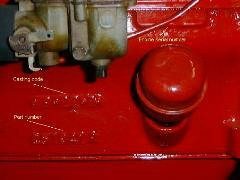 The engine serial number is stamped on the left side of the engine crankcase to the right of the carburetor. Note: Engine and tractor serial numbers maybe different, IH used this engine in other applications. 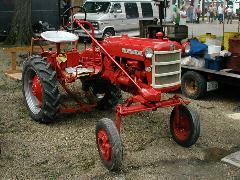 A tractor serial number list is included at the end of this FAQ. In that case, there may be no way to determine the year with any certainty. The engine serial number may provide a general reference. Another method for approximating the age of the tractor is by deciphering the casting codes on some of the major castings. This is not any easy task and is best left to someone with the necessary documentation and expertise to perform this task. We have quite a few ATIS members who would be more than happy to help you research this. I would suggest that you copy down the casting numbers of all of the major castings and post an Email message to the ATIS list with the casting numbers, requesting help identifying the year of manufacture. You can also post a question to the ATIS Farmall Cub Internet Discussion Board requesting help. Additional information and pictures to help identify your Cub can be found on the TM Tractor Parts How to Identify Your Tractor page. Through the years there were a couple of changes to the engine, and later Cubs produced about 14 drawbar HP. The changes that account for this HP increase were an increase in compression ratio, due to a piston change, and an increase in Idle, Max. speed to 1800 RPM, from the original 1600 RPM. There was also a change in the carburetor design, which may have affected the HP slightly. International Harvester designed the Cub to be used as a first tractor on farms that had previously depended on horses for their only pulling power. The tractor was engineered to be very easy to maintain, and to have a minimum of required maintenance. A Cub can be maintained with normal hand tools. Your average small mechanics/ homeowner tool kit, will let you perform 95% of any required service. And in fact when new, Cub’s came with grease gun, wrenches, and a spark plug tool as standard equipment. As with any piece of equipment, you need to make sure that the tractor has all of the necessary fluids. These include water /antifreeze in the radiator, engine oil, hydraulic oil and lube in the transmission, and final drives. I would suggest that you get a copy of the Operators manual, the Parts manual and the Cub Service Manual. These are available from CaseIH Dealers as well as various suppliers of parts for antique tractors. Some of these companies have links on the ATIS Web site. Just about every part you will need to service and maintain a Farmall Cub, is available from your local CaseIH and Cub Cadet Dealer, your local auto parts store, mail order parts house, or a dealer that specializes in parts for antique tractors. 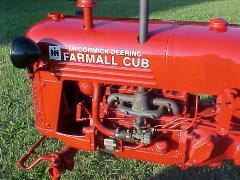 The Farmall Cub was one of the most popular tractors of all time, with nearly 1/4 million standard Cubs built alone. So there is a good supply of used Cub parts. The ATIS Web site has links to various suppliers of both used and new parts for these machines. This table cross references some of the more common IH parts to parts available from some of the other sources. Numbers given here may not all be current. They should help identify current part numbers from your supplier. Seal numbers in bold print have been verified in an IH reference. International Harvester manufactured a large variety of attachments for the Cub series of tractors. There were also attachments manufactured for these tractors from various equipment manufacturers. Hitches for the Cub come in 3 different variations. Category 0/1 3 point hitch. The standard method of attaching implements to the Cub is the quick attach system that uses conical headed bolts and slots incorporated into the attachment frame. Cubs that utilize this system have a solid drawbar that spans from one final drive housing to the other. Implements are either bolted to this drawbar, or the drawbar is removed and they are bolted directly to the tractor. Note: Many of the quick attach type implements were designed only for use with the Farmall Cub. This was typical of most of the row-crop and tillage equipment including most plows, cultivators and planters. Most of the other implements were built in two different designs, one for each model tractor. 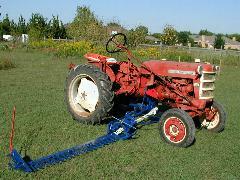 The mowers and blades are examples of implements designed for each model tractor. Most of these implements can not be readily moved from one model tractor to the other. The optional single point Fast Hitch system was developed by IH to provide an easier method of attaching rear mounted implements. This system has a large socket centered on the rear of the tractor that a corresponding prong on the implement slides into. Note: Many of the Fast-Hitch implements for Standard Cub and Low-Boy Cub are different. This is due to the height difference between the 2 tractors. There are also differences between Fast-Hitch implements designed for Cubs and for the larger series IH tractors. So when buying Fast-Hitch implements you have to be sure you are buying implements designed to work with your specific tractor model. Aftermarket suppliers have also produced a standard Category 0/1 3-point hitch for the Cub. This hitch is generally only useful for non-powered implements, due to limitations on the Cub PTO. The PTO is non- standardized, running counter clockwise at engine speed, approx. 1800 RPM vs. the standard PTO which is 540 RPM with clockwise rotation. The PTO shaft on the Cub is also smaller, with a different spline. Therefore any powered attachments, need to be Cub specific versions. This 3-point hitch also limits the maximum implement weight to 300 lbs. Additional implement pictures can be seen by clicking on the following link. When the Cub was first introduced, there was no hydraulic system available. Mounted implements were all lifted by hand lift. The main attachment for this was the “master lift package.” It bolted on top of the differential. It had a large lever, a counterbalance (lift assist) spring and a built in rear rockshaft. This directly provided lift for any rear mounted equipment. To go with this, there was a front rockshaft available that bolted to the bell housing below the gas tank. A rod ran forward from the master lift package to operate the front rockshaft. Front or mid-mounted equipment attached to the front rockshaft to lift them. Shortly, the Touch Control hydraulic system was introduced. The Touch Control system mounted on the bell housing and included a rockshaft that was functionally equivalent to the hand lift front rockshaft. There was a rear rockshaft available to go with the Touch Control. This mounted in the same place the master lift package was mounted and provided the same functionality via a lift rod that connected to the Touch Control rockshaft. Portions of equipment that were reused with multiple models of equipment were refered to as “common units.” Another common unit for the Cub was the front mounting frames. These were a pair of parallel linkage frames that mounted in the square mounting hole just behind the front axle. These connected via a link to the front/Touch Control rockshaft. Thus the hand or hydraulic lift were used to raise and lower the working end of the mounting frame. The frame provided the mounting point for many of the front mounted implements, such as the cultivators and planters. These were five separate attachemnts: master lift package, front rockshaft, Touch Control, rear rockshaft and front mounting frames. Of them, only the Touch Control was considered part of the tractor. The others were all separate attachments that were not shipped as part of a new tractor. Likewise, they were not considered part of the implement either. 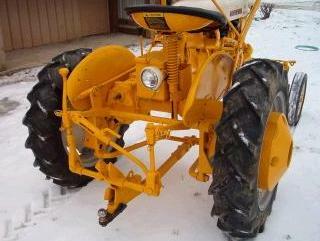 When, for example, the dealer ordered a Cub-144 cultivator, the mounting frames were not included with it. If they were needed, they had to be ordered as a separate item. This way, the customer that wanted multiple pieces of equipment for his tractor only had to buy one set of mounting frames. 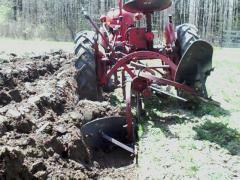 Likewise, the man who didn’t need any didn’t have to buy one set with the tractor. Later on, Fast Hitch was introduced to ease the mounting of rear mounted equipment. This provided a common lifting frame and mounting point on the rear. To go with the Fast Hitch, a whole set of Fash Hitch equipment was introduced. In many cases, front or mid-mounted equipment were able to remain the same but others required some redesign due to the presence of the Fast Hitch. The introduction of the Cub LoBoy (with or without Fast Hitch) added more combinations to this picture. Many pieces of equipment can not be interchanged between a Cub and a LoBoy. Today, when buying equipment to mount on a Cub, the buyer needs to beware of the potential need for the mounting and lifting attachments that he may need but that may not be with the equipment. It seems that the front mounting frames are often with cultivators, but they are less commonly found with other implements. The rear rockshaft is sometimes with a piece of equipment, often times not. 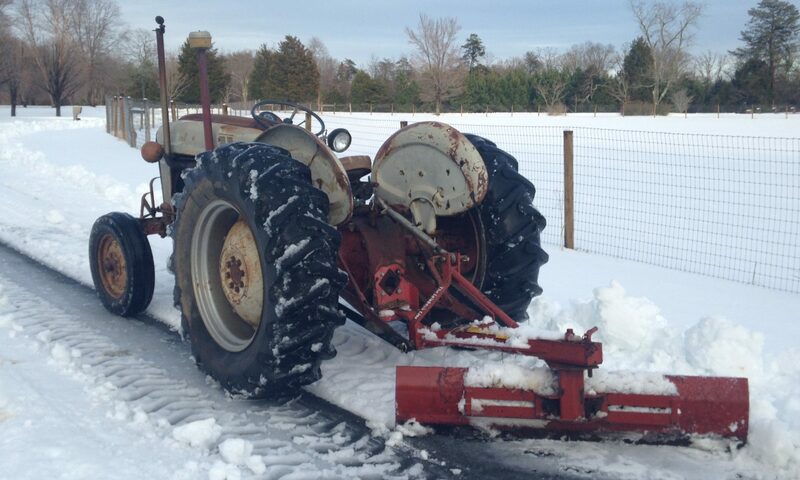 Once in a while, a lucky buyer may have gotten one with his tractor. The buyer also needs to be careful that the equipment is the proper version for his particular tractor and the configuration of attachments on his tractor. Other than the usual things that you would check on any tractor or automobile, smoke from the engine, either from the exhaust or the breather, oil pressure, loose steering, tire condition etc. ), these are some of the areas where you are most likely to find a need for repairs. Engine block: high on the side, ahead of the oil filter, and at the front where block bolts to front casting, check both sides. Front casting: across the front, at the lower edge of the grille, or the horizontal surface directly in front of the radiator, also check for cracks just in front of where the casting bolts to the block. You should also inspect the area around the bolt holes, where the engine and casting bolt together, as the ears sometimes are cracked. Check that the brakes work, that the brake drums have not come loose on the axle. Check the transmission to see if it goes into each gear smoothly, and stays in gear when the tractor is moving. This is especially true of first and reverse. Check that the PTO will engage, disengage and hold. Check the final drive housings for cracks, areas prone to cracks are the flanges, where the housings bolt around the brakes, and attach to the transmission case, or the flange at the axle housing extension. I have also seen final drive housings with stress cracks at the top of the casting. Try to make sure that all of the hardware required to mount any included implements is in fact included. A basic Cub as tested in the Nebraska test of 1947 weighs about 1300 lbs. This was a tractor with no starter, lights, battery, or hydraulic system. Cub rear wheel weights weigh about 150 lbs. each, one piece front wheel weights are approx. 26 lbs. each and split type front wheel weights are approx. 25 lbs. each. The addition of calcium chloride solution in the tires can add an additional 300 lbs. or more. Any additional equipment on the tractor will also add more weight. As you can see, a typical Cub can weigh in between 2500 and 3000 lbs. When you transport your Cub, you need to figure in the combined weight, with everything you are putting on the trailer. In my case I figured about 3500 lbs. ATIS has a very good FAQ about trailers and transporting tractors, that I would recommend to everyone thinking about moving a tractor with a trailer. Safety rules must be followed for the safe Operation of any equipment. 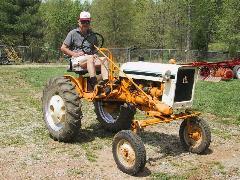 The Cub was designed and built years before many safety features were incorporated on tractors or yard equipment. The Cub was originally designed for row-crop farming and thus was designed for more ground clearance that typical mowing tractors of today. Although it is safe to operate a Cub on reasonably sloped terrain, caution is advised. One should be particularly cautious about operating the tractor up a hill or with the left (engine side) on the downhill side. Stability can be improved by setting the rear tires to the wider positions. Generally, if it doesn’t feel safe, it probably isn’t safe. The pictures accompanying this serial number list are provided to help determine the age of Cub and Cub Lo-Boy tractors. The tractors pictured are representative of the time they were built. Many of these tractors have been restored but are not necessarily restored to their exact original appearance. 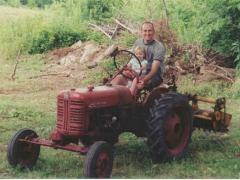 Original Style Farmall Cub. There were several changes to the decals used on these tractors, resulting in some minor differences in appearance. Also, at the beginning of 1950, IH had a demonstrator promotion where tractors were painted white. The color used was “whitecap white,” the same shade that was used on IH trucks at the time. The exact serial numbers of the demonstrator tractors is not known, but it is believed to include serial numbers 99536-106511. IH expected the dealers to repaint these tractors red before they were sold. This was usually done, but occasionally an original white Cub can be found. Restyled to match number series tractors. Cub Lo-Boy Introduced. Fast hitch introduced. White grill and hood sheet name plate background are believed to have been added during ’56, probably at Farmall Cub 197825 and Lo-Boy 3772. Restyled, grill with large horizontal bars. Restyled, Squared Off Grill (August ’63). 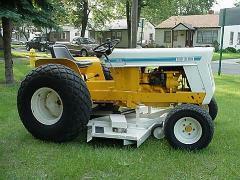 International Cub (Standard color Yellow/White) No evident Lo-Boy change. Small number discrepency, change could have been one unit later. New International Cub Horsepower increased. Note that the parts book indicates that dome-top aluminum pistons were introduced with engine number 264568. This change would increase power. It seems likely that this engine number would have been used earlier than 1975. At serial number 248125, a larger carburetor came into use and other changes were probably made at the same time. 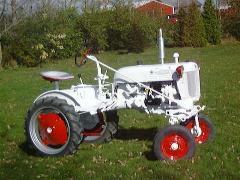 Although the following tractors were not offset designs, they were based on Cub components and replaced the offset Cub Lo-Boy. The numbers also look a bit suspect but they are the best we have available. ’77 43802 – 46162’78 46163 – 48029’79 48030 – ???? ?’80 49873 – ????? Over the years there were some changes to the prefix letters on the serial numbers. I have not identified any particular significance to the changes. Do you have other questions about the farmall Cub? Check page 2 of the ATIS Cub FAQs.